About two months after my last visit to Kerala, I was itching to go back home and enjoy the typical Kerala monsoons. The sound of rain that I hear everytime I call up home increased my urge to visit home. My office gives an off every third Saturday. I decided to take a day off on Monday and make it a three day vacation. Since I was returning on a Monday night, I went slowly about booking my tickets. Made some enquiries around, and found out that Kallada’s Kodungallur-Bangalore B9R would be the safest bet for reaching Bangalore before 6 AM. Accordingly, booked a ticket on that service, departing on Monday, July 23, 2012 from Kodungallur – and I got seat #D1. The bus was having fairly good loads by then. My journey from Bangalore to home was by car. 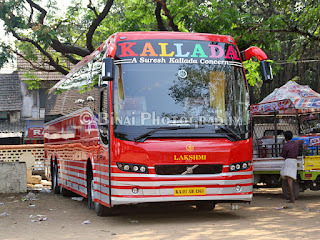 I was hurrying from home to reach Kallada’s agent in Kodungallur in time for my bus. I was a bit shocked on not seeing the bus at their regular parking place. I reached the agent at around 1740hrs. He gave me a surprised look when I asked about the Bangalore Volvo. His looks gave me jitters – would he say that the service is cancelled today? He continued giving me jitters as he handed back my ticket to me. He said that a pick-up bus would come since the actual bus was parked at Irinjalakuda that day, and asked me to wait. Around 1800hrs, he asked me to board a van that was waiting outside. Two more passengers joined me at around 1810hrs. There were five bookings from Kodungallur (including mine). Three were now on board – the other two were to join at Thrissur. The pick-up van driver started from Kodungallur at 1815hrs. The van went via Mathilakam to Moonupeedika. Three more passengers got in. Then the bus headed straight to Irinjalakuda. The van driver drove sedately – no rash driving or honking. 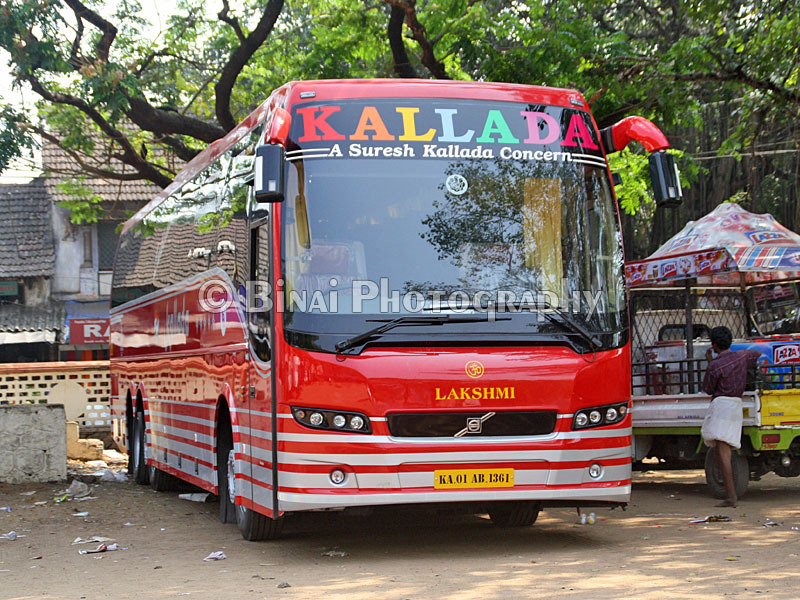 While the van approached Irinjalakuda, I hoped I wouldn’t be getting the red bus – for some reason, I get a red bus every time I travel by Kallada. The van dropped us at Kallada’s office in Tana, Irinjalakuda. As luck would have it, it was the red bus again! 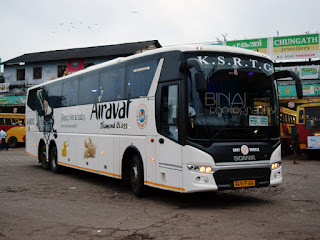 KA-01-AB-1361 – the very same bus that I had travelled in a few months back was waiting there! The bus was parked some distance away from the office – the drivers were still relaxing around, while the office people were preparing to load parcels. The bus: KA-01-AB-1361. This is an old photo. The bus was brought to the office at 1900hrs. Boarding started immediately. They also started loading parcels quickly. There were some parcels to be unloaded at Thrissur itself, while the rest were heading to Bangalore. The bus started moving at 1910hrs – total 18 passengers were on board! The driver had to do a bit of circus to get the bus out of the road. It was a narrow road, exiting onto another narrow road at a 90-deg angle. To add to the misery is the non-stop traffic on the road. After about 10 minutes of struggling, the bus got moving swiftly on the main road. There were two drivers and one cleaner – all from Tamil Nadu. Some album songs sung by Kalabhavan Mani was played on the music system. We reached outside Sakthan Nagar bus station in Thrissur at 1950hrs. Some luggage was unloaded quickly, and some more loaded. Passenger boarding started around 2000hrs – a total of 24 passengers got in here! The bus started moving at 2012hrs – with 42 passengers on board! Not bad for a working day!! 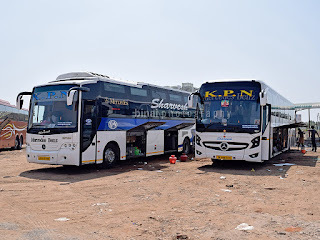 The bus headed straight towards KSRTC bus station – and picked up one more passenger from Jabbar Travels there. After KSRTC stand, the bus headed straight to the round. A movie was now played (a very recent Malayalam flick – I wanted to see this movie since long). The movie kept me glued to the LCD now. There was no pick-up at Mannuthy, and the bus did not stop either. The drivers were quick – they picked up pace pretty well and we were doing fairly decent speeds now. Sometime around 2055hrs, the bus came to a halt. I thought it was a pick-up, and I remained glued to the TV screen watching the movie. The driver got off and walked away – this brought in some curiosity. I realised that we were stuck in a traffic block on Kuthiran pass! The bus crawled for some time, and then waited again. This continued until 2145hrs. I had my dinner in the meantime (I had packed food from home). I was so engrossed in the movie that I did not realise what was happening outside. We stopped at a hotel near Alathur for dinner, at 2205hrs. It was more of a wayside make-shift motel than a proper hotel. I remained outside the bus for the entire duration of break. A KaSRTC Rajahamsa had parked behind our bus, and we could not back out. The break continued till the time the Rajahamsa driver finished his dinner and agreed to move the bus! We started off after the break at 2238hrs. It was raining heavily at this point – heavy would be an understatement, though. I am sure the driver was blinded by the rain. The movie got over a while after the bus resumed after dinner break. After the movie got over, the cleaner came around and closed the rear LCD screen, and also closed the curtains. I dozed off soon after this. I had a fairly good sleep and woke up just when somebody sat on my adjacent seat – we had reached Palakkad for pickup now (2309hrs). The pick-up break was fairly long, and we got moving only at 2317hrs. I slept even before the bus crossed Walayar. 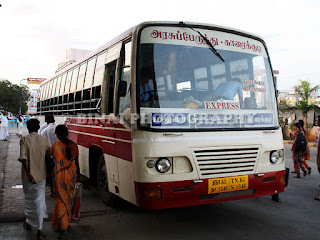 I vaguely remember seeing the bus stopped at Walayar due to a traffic block. I remember the break at a fuel station as well – but was too sleepy to get down or even note the time! I slept through the journey – I enjoyed the journey for this very reason. I woke up around 0520hrs when the cleaner shouted out Hosur and switched on the lights. I think a couple of passengers got off at Hosur – not sure. I was half asleep even at this time. There was a mini traffic block at Attibele Toll gate – this place is a royal pain at any point of time. The driver ripped after Attibele Toll – he was fast and maintained a very good pace. A few passengers got off at Electronic City, and the bus then took the elevated highway. The driver ripped on the flyover as well. I was dropped off at Silk Board exactly at 0600hrs. Considering the awful traffic block at Kuthiran – the driver did a very decent job. The bus took 6:40 hours from Palakkad to Silk Board – adding the traffic block at Walayar, the timing is fairly decent. It took close to 12 hours end-to-end, which is not to my liking, considering the short distance involved. It typically takes me 8-9hrs to cover the same distance while driving down – and I usually do not driver long distance at one stretch. The bus took a lot of stops – and the crew wasted a lot of time everywhere. About the bus: The bus had clocked about 1.07Lakh kms. It was maintained really well – the bus was in really good shape. No abnormal noises or dangling/broken parts inside. The engine noise did not intrude much into the cabin as well. The drivers were decent – no rash driving, hard braking or excessive use of horn at night. I really liked the way the two drivers handled the bus. The bus had 47 passengers - on a Monday evening! That certainly implies that they are doing well on the route. The timings need to be tweaked a bit – but otherwise, the service was very decent. The bus arrived at Bangalore 30 minutes past its scheduled arrival time – but that might be pardoned considering the traffic block. Will I take this service again: Certainly! But please tweak the timings a bit. The bus can start an hour later from Kodungallur, and still make it to Coimbatore at the same timings. College life: then and now..